Apple says that in 2018 it is “turning its attention” to the Mac App Store, bringing the desktop-based storefront more in line with the one found on iOS devices. 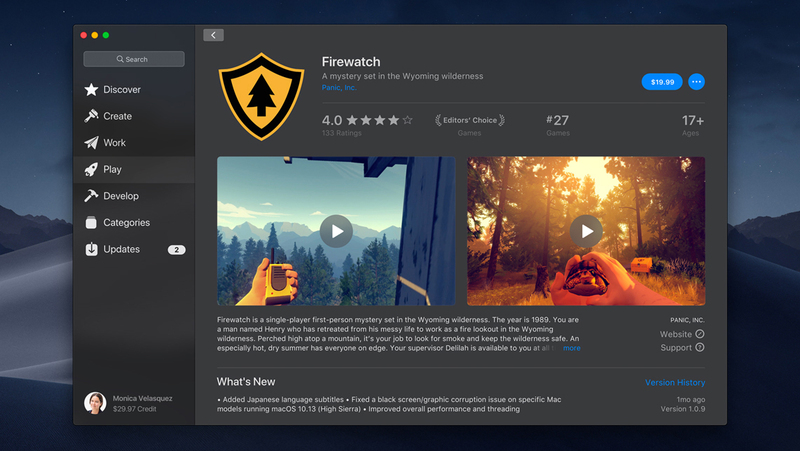 The Mac App Store has been redesigned from the ground up for macOS Mojave, the company says, with a new sidebar that has Discover, Create, Work, Play, and Develop tabs. Like on iPhone and iPad, the Mac App Store will have articles written by Apple editors to showcase useful apps and games currently popular on the App Store. This will be found in the Discover tab and include stories, interviews, tips, app collections, and more. Users can still browse by Categories on a dedicated tab, and app pages now have more useful information like video previews and large screenshots. Ratings and reviews have also been made front and center. The company also mentioned that later this year, apps like Office from Microsoft, Lightroom CC from Adobe, BBEdit from Bare Bones, Transmit from Panic, Live Studio from Snap Inc. and Houseparty, among others, will be made available on the Mac App Store.